2018 Top 50 True Freshman LB’s and their Impact on the Season. Today we move on to my 2018 Top 50 True Freshman Linebackers and their impact on the season. Georgia dominated on this list now 2 straight years with all 5 players having contributed this past year. Out of the Top 50 true freshman on this list, 35 (70%) contributed with stats in some way this past season. Of the 35 players with stats, 8 were from my Top 10. There are 6 players on this list that topped over 25 tackles this year. PS#1 Micah Parsons of Penn St came in 1st on this list with 82 tackles also becoming the 1st True frosh to ever lead PSU in tackles. PS#17 Merlin Robertson of Arizona St came in a close 2nd with 77 tackles followed by Dax Hollifield (PS#10) of Virginia Tech with 62. The sacks leader this past year was PS#17 Merlin Robertson with 5 also the only player on this list with an interception. The 2018 Top 50 True Freshman Linebackers totaled 522 tackles, 20.0 sacks and 28.0 tackles for loss. 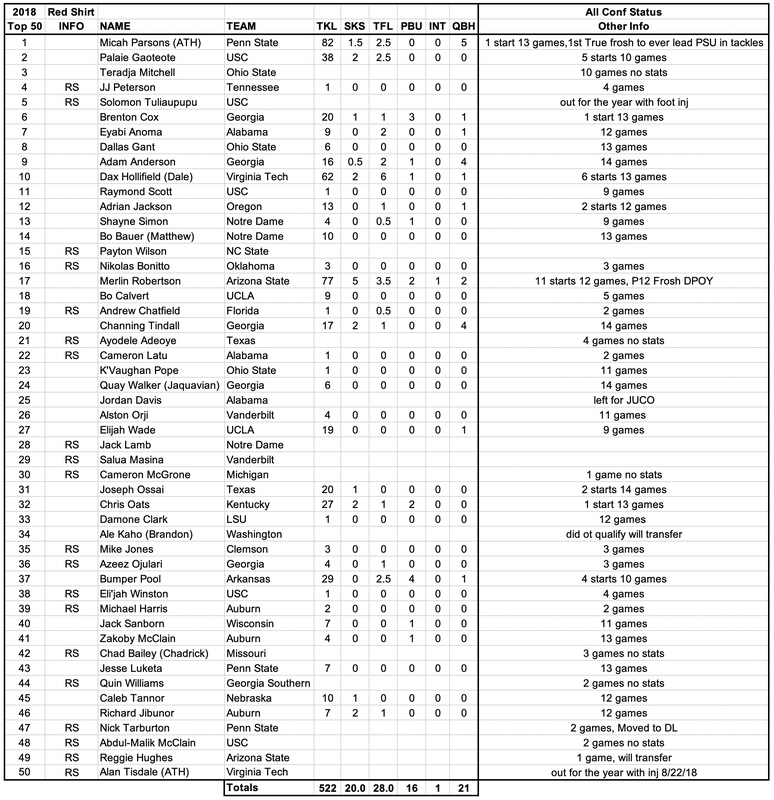 Here is the complete list of my 2018 Top 50 True Freshman Linebackers. Here are the Top 50 True Freshman LB’s for 2019. Will Georgia players dominate again for the 3rd straight year? On Monday we release the final position of the 2018 Top 50 true freshman with the DB’s.